Stoke City have signed winger Matthew Etherington from West Ham United for an undisclosed fee. The 27-year-old, who joined the Hammers from Tottenham Hotspur in 2003, has signed a three-and-a-half-year deal at the Britannia Stadium. He told BBC Radio Stoke: "I think there was some interest in the summer but nothing came of it. "I had a few conversations with Tony Pulis and he was brilliant. He made me realise this was the right move." 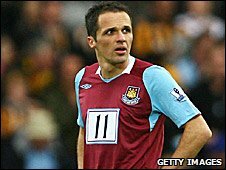 Etherington has made 13 Premier League appearances for West Ham this season, but has fallen out of favour under new manager Gianfranco Zola. He is now in line to make his Stoke debut at home to Liverpool on Saturday. And he hopes to bring an extra attacking threat to the Britannia Stadium. "Hopefully I can bring something going forward, make goals for the strikers and pop up with a few myself," said Etherington. "I like to run with the ball and take on the full-back so that's what the supporters will see me do. "I'll do everything I can to be the best player I can be for Stoke City. "I've heard about the noise the fans make so I'm looking forward to playing here." The former Peterborough United man becomes Stoke's first signing of the January transfer window. He joins the Potters as they sit in third from bottom in the Premier League, but said he has been impressed by what he has seen from them this season. "They've made a great start but things haven't gone so well over the past few games," added Etherington. "There's a tough few games coming up but, after that, there's a big opportunity to pick up some points."